Shooting moving bikes is all about action. Bikes are associated with speed and agility, and that is exactly what photographs of moving bikes must convey. I will dissect the anatomy of action shots in this post and present the effect the shutter speed has on an image. A fast shutter speed (1/320 s and above) will start to freeze an object in motion with the moving object becoming sharper the faster the shutter speed is. On the opposite site, the moving object becomes unsharper (“motion blur”) the slower your shutter speed is. There are no fixed values when an object can be depicted tack sharp and when not, because it also depends on the speed of the moving object. 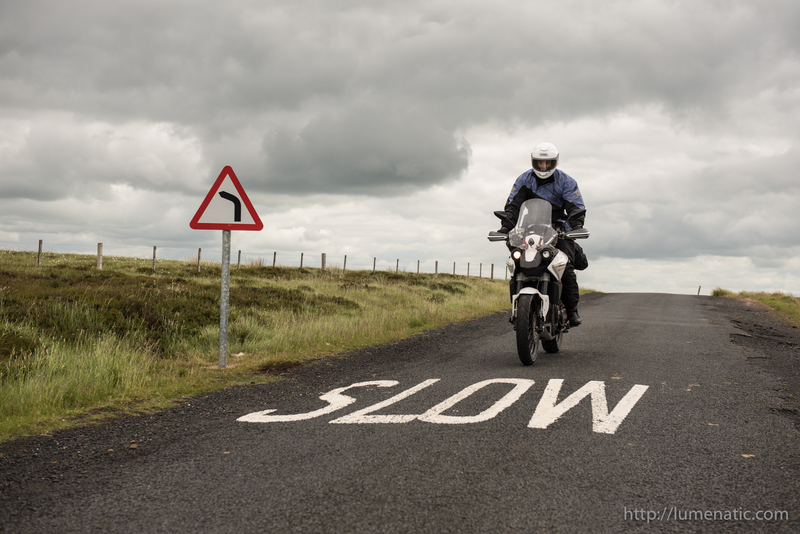 If the bike is driving at walking speed you might get a sharp image at even 1/200s. If you photograph a MotoGP race with bikes zooming past you at 300 km/h and more, a much, much faster shutter speed will be necessary to receive a sharp image. The bikes themselves are sharp, the tyres show some motion blur since they rotate quickly (the bikes were moving at speeds between 50-70 km/h). 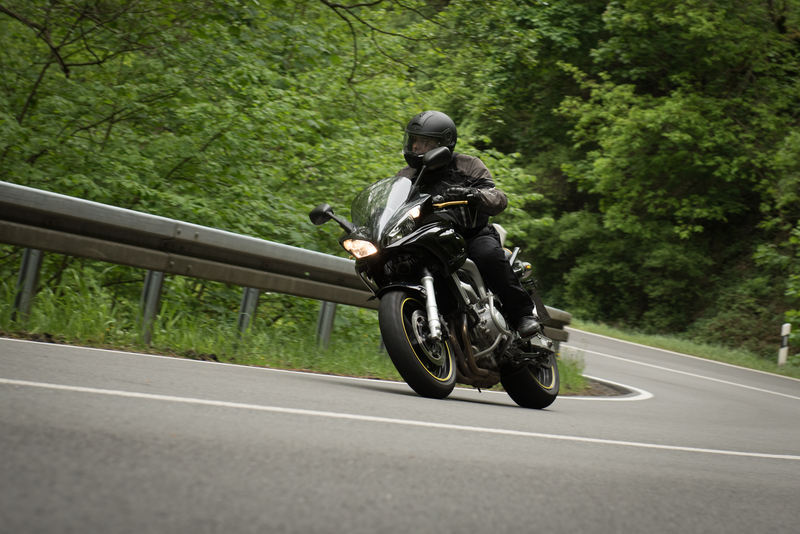 The images convey speed and action, because the bikes are at a lean angle. On the third image the camera has been tilted to increase the tension. 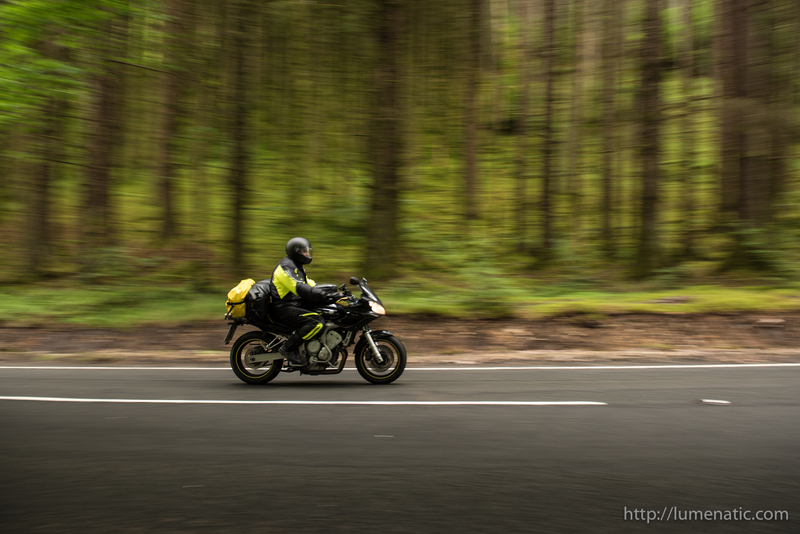 The image was taken at 1/500s, the bike was moving approx. 50 km/h. 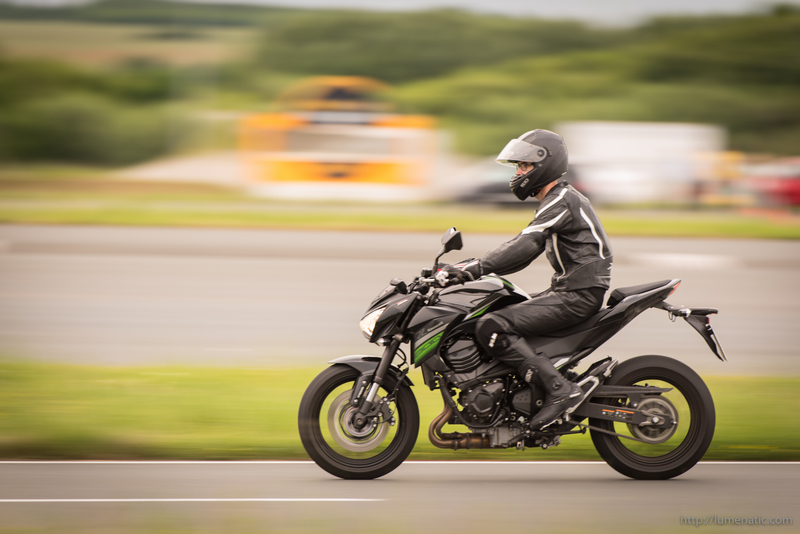 The speed is not visible, because the bike is sharp with only a little motion blur at the wheels and it stands upright. So you look at that image and your first impression is “nah, not interesting” because there is no tension. Here we have blurred wheels, the bike at a lean angle and a tilted camera. Everything tells you that this bike was just zooming through the curve. In reverse to the above stated a “slow” shutter speed shall be everything 1/250 and slower. At these shutter speeds we start to get motion blur when photographing a moving object. Again, the slower the shutter speed, the more motion blur will occur. There are basically three possible techniques at slow shutter speeds: Stationary shots, piggyback shotgs and panning. This image was taken at 1/20s (one twentieth of a second) ! The bike moved at only around 30 km/h, I stood beside the road with a handheld (!) camera. I kneeled down, stabilizing myself as good as possible. 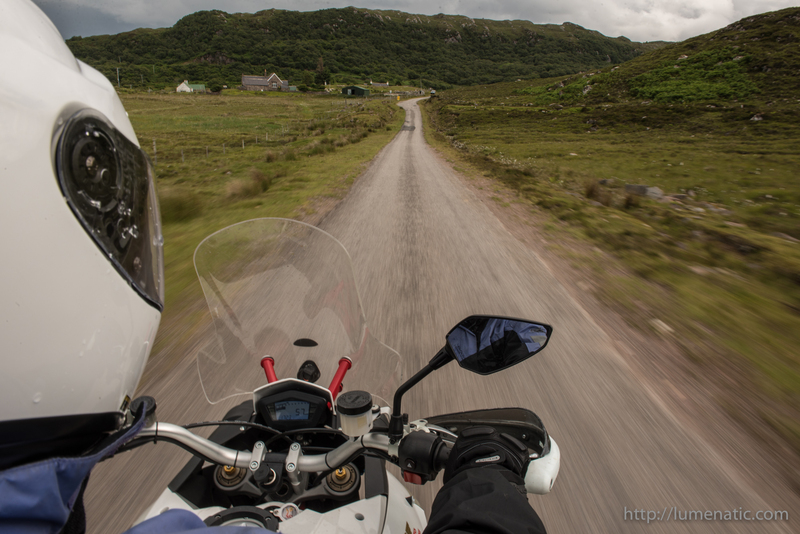 The camera was set to burst mode and as the bike drove past me I took a series of 10-15 images. The funny thing with those handheld shots is, that there will be at least one shot with a sharp environment, although the camera was handheld. Try it, it works. 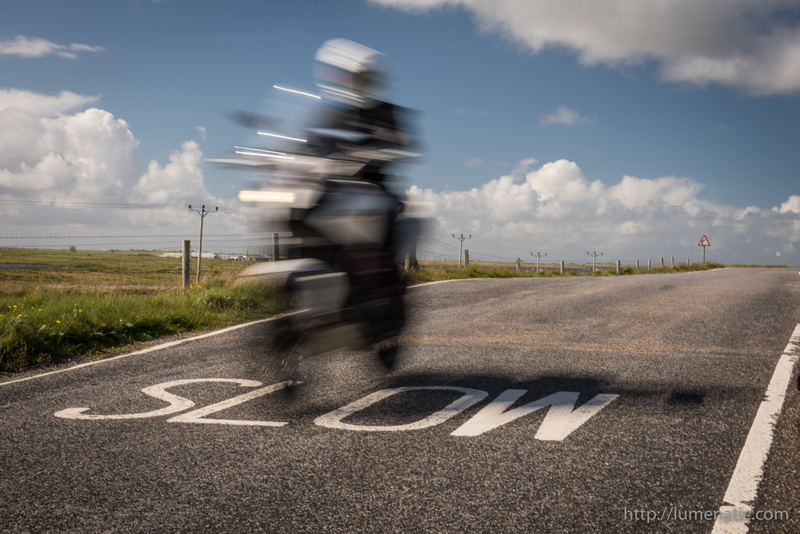 The motion blur is clearly visible and the image shows a nice contrast of the word “SLOW” written on the road and the blurred bike, which suggests it drove at a high speed. This is another example of a steady shot at a slow shutter speed (1/80s). 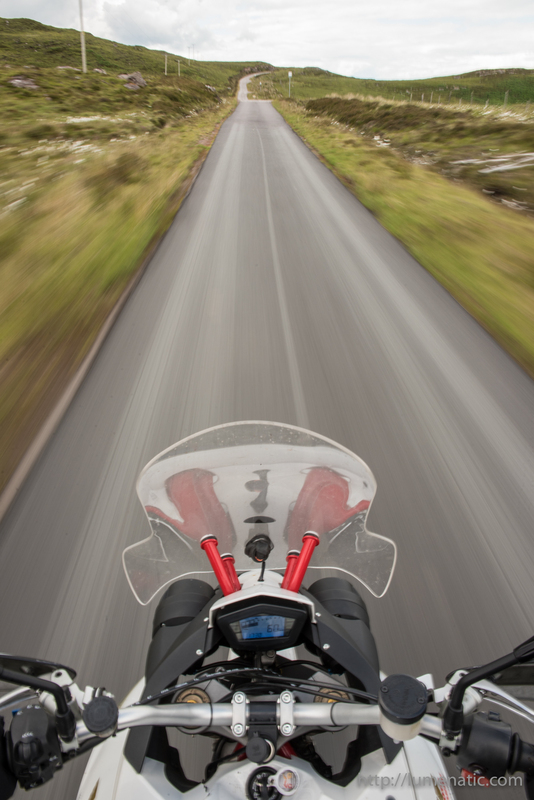 The same effect is achieved: The environment is sharp, the bike blurred. For these shots I sat behind the rider with my gloves off to operate the camera. I had burst mode and live view enabled, as the helmet and seating position would not allow to look through the viewfinder. Look at the speedometer, we weren’t riding fast, but the slow shutter speed makes you believe otherwise (if you want to show off you can easily manipulate the speed in post by adding a third digit ;-). These shots show another interesting effect of slow shutter speeds. The bike’s cockpit is sharp (as it did not move relatively to the camera). The environment near to the bike is motion blurred (as it zoomed past the bike quickly). With increasing distance from the camera the motion blur is reduced and the horizon (the optical “infinity”) everything is sharp again. That’s because during the exposure the horizon did not move closer considerably, but anything near the bike did. Panning is the third of the slow shutter techniques. Here the moving object is tracked in the viewfinder during the exposure, so that the bike itself is sharp and the environment is blurred. 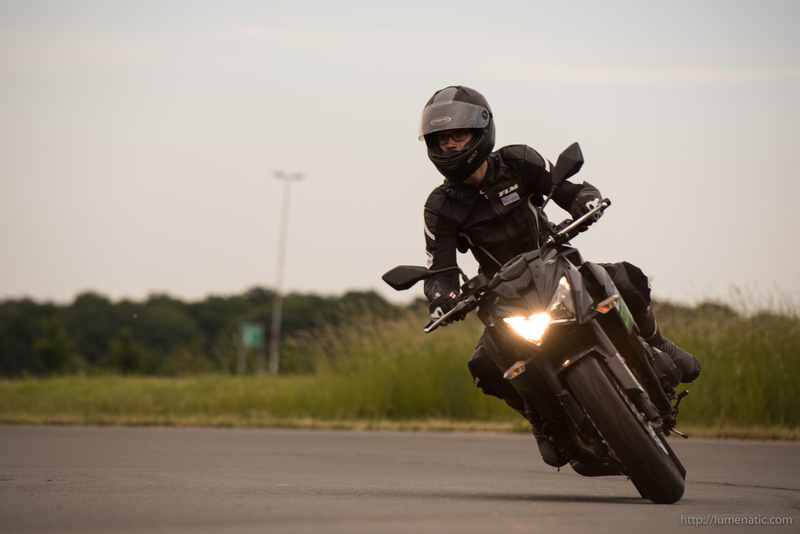 For this technique to work you need to assume a position from where the bike can be seen from roughly the same angle during the exposure. 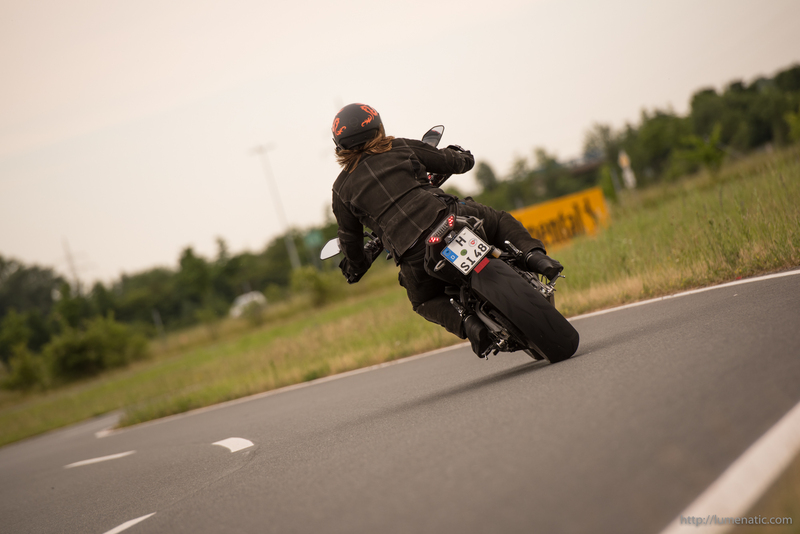 A straight piece of road or the apex of a curve is a good place. Not so well suited are steep shooting angles like standing beside the road with the bike coming towards you. One final word on sharpness. The bike does not have to be tack sharp to the last pixel for these images to work. In fact, a slight (very slight !) amount of unsharpness adds to the dynamic character of the image. If the bike is too sharp it might look artificial, as if someone had copy/pasted it into the image in post.